Art should not be a luxury. A few weeks ago I was doing a live painting event in a playground. It was for a good cause and I was able to finish two portraits while listening to some awesome entertainment and meeting some very nice people. I had just started working on a third portrait, when a little boy came up and asked , “Who’s that?”. I was surprised he didn’t know. I kicked into teacher mode and asked him what grade he was in. “Fifth”, he said. Well, I think you should know who Einstein is by 5th grade, at least you should have heard the name before. I told him a little about Albert and then asked him about the two other subjects I had painted that day. They were a bit more obscure for a 5th grader, so I cut him some slack. He seemed satisfied with the three minute synopsis of a Nobel prizewinner, but of course, I had to challenge him. “How about, the next time you have a book report due, a biography, pick one of these people and learn more about them.” He looked at me sideways, surely at the thought of book reports in August, and said “Ok, I’ll do that.” I hope he does. Now, my own children said maybe I was expecting too much, “It’s summer, he’s not thinking about school”, “You know kids don’t remember everything.” , true, but a little sad nonetheless. As a result of this encounter……I will be posting a portrait each month of people I think we should all know more about. Maybe you’ll learn something new, maybe you’ll be able to tell me something new, or maybe it will just be a nice picture for you to look at. I kind of hope it’s the first two though, makes it more interesting. DID YOU KNOW? : Einstein was asked to be the president of Israel, but he declined: After Chaim Weizmann, Israel’s first president, died in 1952, the country’s prime minister offered the job to Einstein. 27 Aug	This entry was published on August 27, 2013 at 1:33 am. 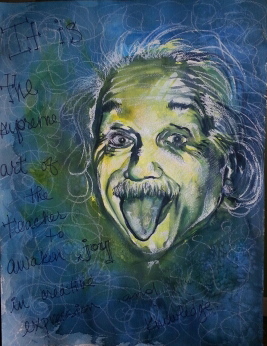 It’s filed under artwork and tagged biography, Einstein, know, learn, portrait, question, quote, teach, watercolor. Bookmark the permalink. Follow any comments here with the RSS feed for this post.